Is further national and international perpetuation of the use of the ‘Letters and Sounds: Principles and Practice of High Quality Phonics Six-phase Teaching Programme’ as a programme in reality a current and classic example of the Naked Emperor? Note that I have included the word publication in the title of this critique as this is one aspect that I am going to examine – the criteria for a publication to qualify as ‘a programme’ – along with other issues relating to the historic events, the content, and the delivery of ‘Letters and Sounds’ in our schools, and the use of ‘Letters and Sounds’ in our universities for training student-teachers in England – and further, the perpetuation of this publication in England and overseas. My interest in teaching methods and their effectiveness extends to an international perspective– and increasingly I note that ‘Letters and Sounds’ is not only regarded as a leading publication in England – but also around the world, for example in international schools and in whole regions such as Western Australia. Does ‘Letters and Sounds’ qualify as a programme? Are the principles and practice underpinning ‘Letters and Sounds’ up-to-date and evidence-based? Is the content adequate, and are the suggestions for games and activities adequate and deliverable, and are the time-scales adequate, to support teachers in providing mainstream and special needs teaching over a period of broadly four years for whole classes and individuals (approximately three year olds to seven year olds – in England this would equate to Foundation Stage One and Two, and Key Stage One)? In the light of the passage of time (at the time of writing, six years following the publication), can we identify and understand any particularly positive or negative features in ‘Letters and Sounds’ to address for our continuing professional development? Further, can we recognize any patterns of practice of teachers’ translation of the guidance in our schools in positive and/or negative ways – and, if so, how can teachers adjust their practice accordingly for potentially greater benefits? Can we identify features of teacher-training in our universities and in-service training associated with ‘Letters and Sounds’ which is, or is not, sufficiently in-depth to move the teaching profession forwards? Do professionals (e.g. teachers/advisors/inspectors/trainers/curriculum developers) have sufficient knowledge and capacity to be able to evaluate, compare and contrast features and results, or likely results, of ‘Letters and Sounds‘ and of phonics programmes – commercial or in-house? Does professional development include support and capacity for teachers – and others – to evaluate, compare and contrast programme-content and teacher-practices of any phonics programmes and practices? Are the universities associated with teacher-education looking into the range of relevant issues such as those above? Thus, the imperative in my mind for this critique is based on my particular interest and specialism in the field of literacy, my personal opinion regarding the content of ‘Letters and Sounds’ on a practical level, my observations in some schools in England and overseas of the translation by teachers of ‘Letters and Sounds’ guidance into practice and the hardship for teachers and children that this is in danger of causing, and my concern regarding teachers’ professional development in terms of building on findings to date – in other words, I suggest that there are dangers inherent in ‘treading water’ or being complacent on any level. This multi-part posting will form the basis of a detailed critique of the ‘Letters and Sounds’ publication which I shall eventually provide as a one-piece paper. In truth, I think a detailed and deep evaluation is potentially so important for moving the education profession forwards that I perceive any evaluation must be as objective as possible (when in reality no one person can be truly objective). For the critique to have any value, it needs to be very detailed and not superficial in order to evidence opinion as far as is practicable – my critique itself must stand up to scrutiny. I suggest that a critique was needed from the outset of ‘Letters and Sounds’ being rolled out in 2007 – when it was provided as multiple copies of free hard-copy material in infant and primary schools in England and presented as a possible ‘programme of choice’. With the weight and authority of this being presented as the government ‘programme’ and the climate of ‘what would Ofsted [inspectors] want to see’ setting the scene – and the fact it was free of charge therefore to all intents and purposes with no associated commercial vested interests, naturally many schools ‘chose’ to base their phonics provision on ‘Letters and Sounds’. What has been the effect of this? What is the effect now? It is important, however, to understand the important sequence of events leading up to the publication of ‘Letters and Sounds’ which is, no-one can deny, a landmark document. If you are interested in what Debbie has to say, please 'like', 'share' and 'follow' - it could help make a difference! This entry was posted in DfE (Department for Education - UK), Education, Government Policy, Letters and Sound, Literacy, Ofsted, Phonics, Teacher Training, UK Specific and tagged phonics, reading, spelling, teaching, writing on November 24, 2013 by Debbie. DfE and Ofsted – left hand, ‘write’ hand? I suggest that the Department for Education’s official ‘criteria for assuring high-quality phonic work’ neglects to pay specific attention to handwriting – and Ofsted clearly hasn’t understood the principle of avoiding ‘circuitous routes’! 5. Multi-sensory activities should be interesting and engaging but firmly focused on intensifying the learning associated with its phonic goal. They should avoid taking children down a circuitous route only tenuously linked to the goal. This means avoiding over-elaborate activities that are difficult to manage and take too long to complete, thus distracting the children from concentrating on the learning goal. A number of phonics specialists, me included, have taken Ofsted to task for uploading video clips with precisely the kind of ‘circuitous route’ which is ‘distracting the children from concentrating on the learning goal’. Ofsted – Is this a bit of an ‘own goal’? We see children trying to do a bit of phonics spelling on mini whiteboards whilst sitting on the playground and at the same time trying to play the parachute game. It’s all rather bizarre. Ofsted, methinks you may be trying to soften your image perhaps? Ofsted has paid insufficient attention to the DfE ‘core criteria’ and certainly hasn’t helped teacher-trainers and programme-authors in their endeavour to clarify what ‘multi-sensory’ looks like for the most effective and appropriate phonics teaching! A break-down of the phonics components required for teaching and learning illustrates how handwriting is linked heavily to both teaching the alphabetic code and the alphabet and is essential for high-quality phonics provision. It’s a great pity that I seem to be swimming against the tide when it comes to children using actual paper and pencils to practise their skills when mini whiteboard ‘activities’ (and carpet sitting) dominate educational practice in England from the teenies right up to the teens! But what could be more fit-for-purpose than paper and pencil practice sitting comfortably at tables when teaching reading, spelling and handwriting? Also on the Ofsted videos we see, sorry to say, some Y1 teacher’s handwriting which is not great (lovely chap though) and some worrying infant practice. We see one lovely little girl writing on her mini whiteboard from bottom to top! Ofsted – is this really your definition of ‘outstanding practice’? Ah, that explains it, you tell us you weren’t looking to scrutinise ‘handwriting’ on this occasion. After all, it’s not mentioned in the ‘core criteria’ so it’s clearly not important. See ‘Debbie Hepplewhite’s Model of the three phonics core skills and their sub-skills’ – you may find this useful to see how much is involved with the teaching of handwriting. Go here for free alphabet resources and guidance on my handwriting website. The core criteria provide schools with clearly defined key features of an effective, systematic, synthetic phonics programme. 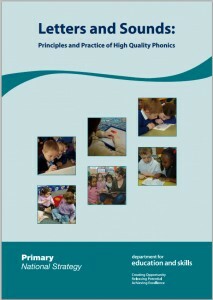 Published programmes for phonic work should meet each of the following criteria. Further explanatory notes are offered below. 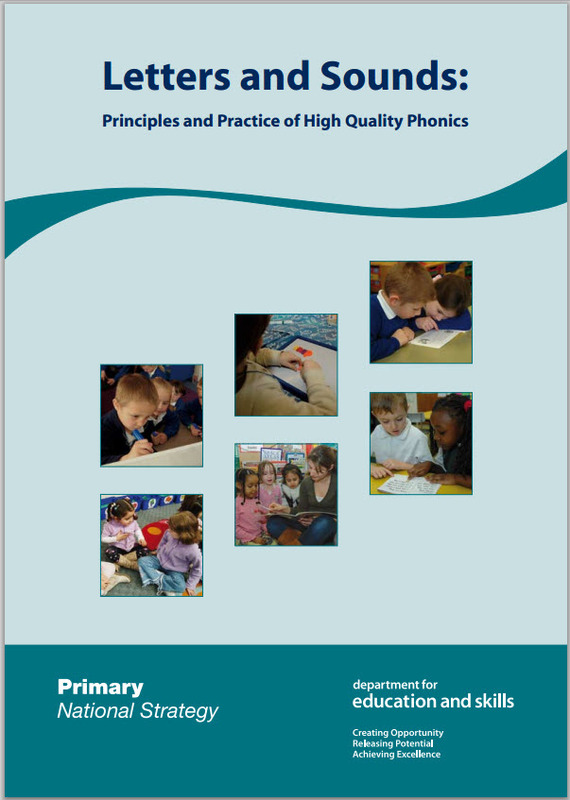 ensure that as pupils move through the early stages of acquiring phonics, they are invited to practise by reading texts which are entirely decodable for them, so that they experience success and learn to rely on phonemic strategies (see note 7). blending and segmenting are reversible processes. 2. Teachers will make principled, professional judgements about when to start on a systematic, synthetic programme of phonic work but it is reasonable to expect that the great majority of children will be capable of, and benefit from doing so by the age of five. It is equally important for the programme to be designed so that children become fluent readers having secured word recognition skills by the end of key stage one. 3. The programme should introduce a defined initial group of consonants and vowels, enabling children, early on, to read and spell many simple CVC words. 4. If the programme is high quality, systematic and synthetic it will, by design, map incremental progression in phonic knowledge and skills. It should therefore enable teachers to: track children’s progress; assess for further learning and identify incipient difficulties, so that appropriate support can be provided. 6. The programme should not neglect engaging and helpful approaches to the more challenging levels where children have to distinguish between phonically irregular graphemes and phonemes. 7. It is important that texts are of the appropriate level for children to apply and practise the phonic knowledge and skills that they have learnt. Children should not be expected to use strategies such as whole-word recognition and/or cues from context, grammar, or pictures. This entry was posted in DfE (Department for Education - UK), Education, Government Policy, Literacy, Ofsted, Phonics, UK Specific and tagged handwriting, reading, spelling, teaching, writing on November 9, 2013 by Debbie. How to Reduce Learning Difficulties – for Teachers and Learners Alike! Tweets by Debbie . . . . !